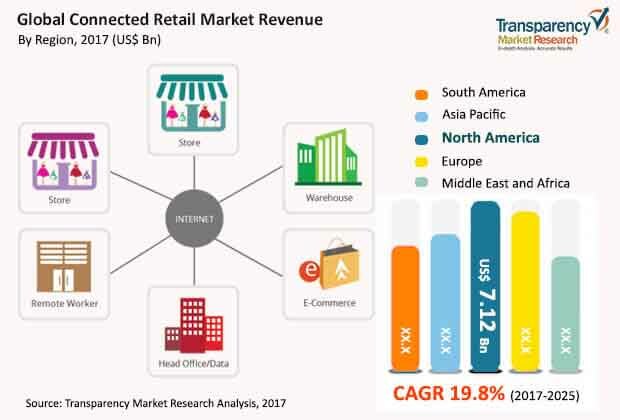 A recent business and commerce publication by Transparency Market Research (TMR) has observed that the demand in the market for connected retail is expanding leaps and bounds and a number of players are connecting to the value chain. There are widespread possibilities with the growing field of the Internet of Things (IoT), paving a reliable mode of interaction between a company and its customers. The analysts of the report have evaluated that the global connected retail market was worth merely US$16.30 billion in 2016 and US$19.46 billion in 2017, but the future prospects are enormous with the valuation of the market estimated reach US$82.31 billion by the end of 2025. During the forecast period of 2017 to 2025, the demand in the global connected retail market is projected to increment at a phenomenal CAGR of 19.8%. “For the market leaders to stay ahead of the curve, product innovation is paramount,” suggests the lead analyst of the report. Nearly every major player of the global connected retail market are International vendors of technology and investment on the research and development of innovative products is their primary focus. However, there are strong possibilities of new entrants making a mark in this market too via niche approaches and hence, activities of mergers and acquisitions are highly anticipated in the near future. The TMR report identifies Amazon Web Services Inc. (Seattle, U.S.), Google Inc. (U.S.), Microsoft Corporation (Washington, U.S.), Cisco Systems (San Jose, California), International Business Machines Corporation (IBM) (U.S.), Verizon (New York, United States), Belatrix Software (Redwood City, U.S), Softweb Solutions Inc. (Chicago, U.S), ARM Holdings PLC (Softbank Group) (Cambridge,U.K), SAP SE (Germany), Atmel Corporation (Microchip Technology Inc.) (California, U.S), Intel Corporation (Santa Clara, U.S), Zebra Technologies Corp. (U.S), Fujitsu Limited (Tokyo, Japan), NXP Semiconductors NV (Netherlands), and PTC Inc. (Massachusetts, U.S) as some of the key companies in the global connected retail market. Based on connectivity, the TMR business publication segments the connected retail market into Wi-Fi, Zigbee, Bluetooth, NFC, and others. On the basis of component, the market has been bifurcated into hardware and software. The market has been further categorized on the basis of end users into electronics and appliances, beauty, home and personal care, food and beverage, apparel footwear & accessories, home goods, sporting goods and toys, and others. Region-wise, North America is highlighted as the one that will provide the maximum demand throughout the forecast period, although the demand from Asia Pacific is primed to expand at most robust growth rate among all rgions. The global connected retail market is mainly driven by the increasing adoption of the IoT across retail industries. Additionally, rapid growth in online shopping is another major driver of the market. The Internet of things (IoT) are focused upon innovation and are generating new opportunities by bringing consumers and every object into the digital realm. Application of the IoT in the retail industry will provide real-time insights from connected stores, combined with cognitive computing and rich data, which will transform the in-store experience and streamline the operations. The increasing penetration of smartphones has become the hub of interaction between customers and retailers. Nowadays, retailers are focused upon exploring ways to connect with the customers in order to enhance the in-store experience. For instance, with location based beacon technology, retailers can connect with the customers when they enter the store. Departmental stores such as Hudson’s Bay and Lord and Taylor use Apple’s iBeacon technology and a mobile networking platform, which is called Swirl where they can send personalized promotions to the customers who download the app of that particular brand. However, the lack of IoT standards and issues regarding safety and privacy are expected to restrain the global connected retail market in the near future. Expanding possibilities with the IoT driving demand in the connected retail market. Competitive landscape largely fragmented, although there are enough opportunities in product innovation that will lure even more technology players. Privacy issues remain the primary restraint.